This indicates ulceration of the gastro-intestinal tract due to the combined action of hydrochloric acid and pepsin.This occurs most commonly in either the stomach or the duodenum. But it may also occur in the oesophagus, following gastro-oesophageal reflex. It may also occur in the jejunum after partial gastrectomy. 1. This precise reason of the triumph of acid and pepsin over the defensive mechanism of the mucosa is unknown. 2. There is however, a tendency to greater secretion in patients with a peptic ulcer. 3. Patients of gastric ulcer tend to have lower secretion and some degree of gastritis. 4. Gastric ulcers occur three times more than duodenal ulcers. 5. A greater proportion of these patients are blood group o and so fail to secrete ABH blood group substance in the saliva. 6. Stress is generally considered to be a striking cause of peptic ulcer, especially for duodenal ulcer patients. 7. The mortality rate among smokers being higher, tobacco may be another predisposing cause although there is no positive evidence for it. 8. There is a greater danger in patients of rheumatoid arthritis who use aspirin and other allopathic drugs. 9. There is probably a higher incidence of the disease in patients with hepatic cirrhosis and chronic respiratory disease. 10. Hyper-para thyroidism is often associated with an increased incidence of peptic ulcer. 1. There is little difference between the symptomatology of patients with gastric and duodenal ulcers. 2. The main symptom which is pain, localized to the epigastrium, is periodic with remission lasting days and weeks, months or years. 3. The pain comes on later in the morning, becomes worse towards evening and rarely occurs after breakfast. It may wake the patients at 2A.M.It may be eased or aggravated by food and often improved within 10 minutes of taking alkalis(e.g. milk). 4. Occasionally the patient vomits which eases the pain. 5. Another symptom is water brash which seems to be caused by an increased salivary secretion. 6. Occasionally heartburn and water brash may predominate. 7. On other occasions, the patients may have a painless course and present with a complication. 8. When the ulcer penetrates through the intestinal wall, perforation is said to occur. If this happens posteriorly it often passes into the pancreas and give rise to a fistula between the stomach, duodenum, colon, gallbladder or bile-duct. In such circumstances the periodicity of the pain changes and alkalis and food fail to relieve. There may be a severe back pain also. Duodenal ulcer is differentiated from chronic gastric ulcer, stone in the gall bladder or kidney, and chronic appendicitis by its characteristic pain. Diagnosis can be confirmed best by X-ray examination. Prognosis: With careful dietetic treatment and regulated mode of life the prognosis is quite favorable. · During the first week, milk diet, which may be flavored with cocoa or coffee, is advised. · During the second and third week, soft boiled egg, white pulp of bread, rice and sago. · In fourth and fifth week boiled fish or chicken, custard, pudding, fresh casein, soft vegetables, boiled and made into a paste, sooji, soft rice and fruit jelly. Food is to be given every other hour or the third hour. Semi-solid food in adequate quantity is to continue for several months. 1. Arsenicum. With dry red tongue, thirst, or typhoid conditions e.g. 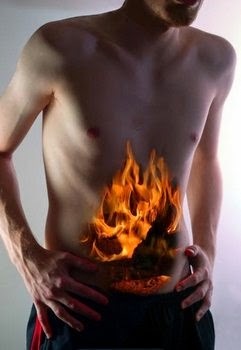 diarrhea delirium, great prostration, vomiting soon after eating or drinking and great burning in stomach. 2. Kali Bichromium. Round ulcers of stomach at the cardiac end; pain relieved after eating; vomiting of bright yellow matter; cutting pain soon after eating. 3. Ornithogalum Umbellatum.It action is on duodenum and pylorus especially; also for suspicion of stomach cancer. Contractive pain and abdominal distention. Complete prostration, nausea. 5. Argentum Nitricum. Gastric ulcer with gnawing pain circumscribed to a small spot. 6. Symphytum. For gastric and duodenal ulcers. 7. Atropine. For cardialgic pain of gastric ulcer. It gives relief. 8. Phosphorus. Useful in vomiting as soon as food or liquids become warm in the stomach. Vomiting of food with mucous, bile and blood. 9. Carbo Veg. Sour vomiting with bloody masses, and burning in stomach. 10. Nitric Acid. To arrest the tendency of formations.